You can make it more convenient to administer your domain's Office 365 service and resource accounts by delegating administration of individual service and resource accounts to other NetIDs. Assigning a NetID as an Authorized Administrator grants that NetID with Domain Administrator privileges over the account. Note for administrators: In order to administer another NetID account in the Wisc Account Administration site, you must have administrative access over the account. To request administrative access over an account, follow these instructions. End users can also grant administrative access. Once administrative access has been granted, you can administer the account. If a NetID is already the administrator of a domain, it can administer all service accounts within that domain. If it is not the administrator of the domain, it is still possible to assign that NetID administration privileges over one or more service accounts within the domain. A NetID that has been granted administrative rights to an Office 365 service account, but not the entire domain the service account exists in, is called an "authorized administrator" of that service account. Note: These actions can only be performed by a user who has administrative privileges over the service account. This means either those who are a domain administrator of the service account's domain, or those who have already been designated as an authorized administrator of this service account. Log in to the Wisc Account Administration site with your NetID credentials. Select the service account you want to manage. If you do not see the account you want to manage or are placed into your NetID account, review the following document: Wisc Account Administration site - Logging in. Once the account homepage is loaded, select Account Administration from the menu on the left-hand side. 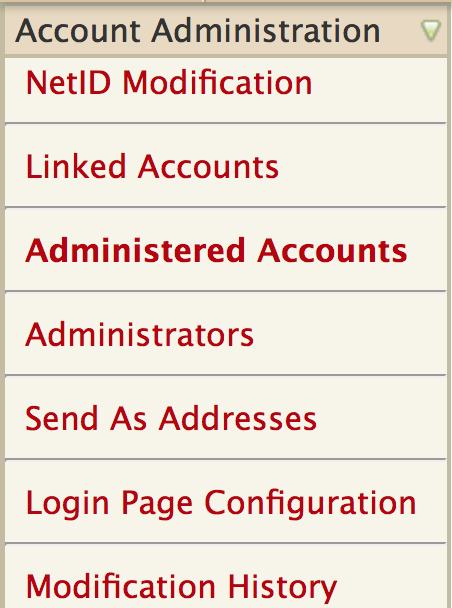 From within the Account Administration menu, select Authorized Admins. Under the Authorized Admins heading, enter the NetID(s) and/or Manifest group (complete path) into the field provided, then click the Add Administrator button. Note: if you need to create a new Manifest group, use these instructions. Select Account Administration from the menu on the left-hand side. If you don't see the desired NetID(s) listed here, you will need to have a domain administrator, or one of the authorized administrator listed here, add the authorized NetID for the service account. Under the Authorized Admins heading, click the Remove button next to the NetID or Manifest group that should no longer be an authorized administrator of this service account. Important: If an authorized administrator removes their own NetID as authorized administrator, they need to log out of and back into the Wisc Account Administration site to avoid using features they no longer have access to use which will result in error messages. If a NetID is already the administrator of a domain, it can administer all resource accounts within that domain. If it is not an administrator of the domain, it is still possible to assign that NetID administration privileges over one or more resource accounts within the domain. A NetID that has been granted administrative rights to an Office 365 resource account, but not the entire domain the service account exists in, is called an "authorized administrator" of that resource account. Note: These actions can only be performed by a user who has administrative privileges over the resource account. This means either those who are a domain administrator of the resource account's domain, or those who have already been designated as an authorized administrator of the account. Select the resource account you want to manage. If you do not see the account you want to manage or are placed into your NetID account, review the following document: Wisc Account Administration site - Logging in. Under the Authorized Admins heading, click the Remove button next to the NetID or Manifest group that should no longer be an authorized administrator of this resource. Important: If you remove your own NetID as authorized administrator, you need to log out of and back into the Wisc Account Administration site to avoid using features you no longer have access to use which will result in error messages.